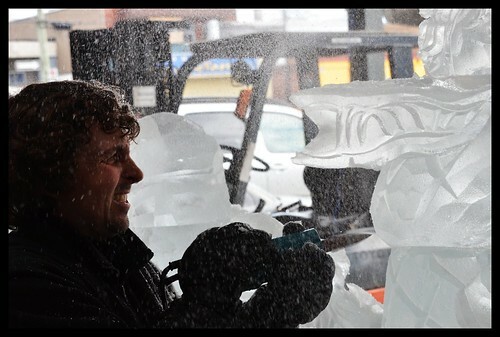 First up was a visit to the farmer's market at Jean Talon, where we came across this guy carving out an ice statue with power tools. I couldn't resist some pictures of him in action. Ice Sculptor, a set on Flickr. Then we wandered downtown where the annual Montreal et Lumiere festival, which usually makes for some good pictures as they put on light shows and installations. The pick of the bunch was this one. 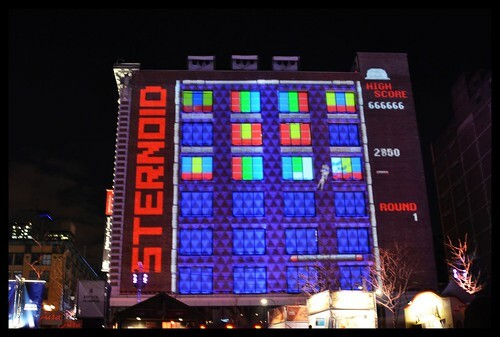 They turned the side of a building into a game screen via massive projection. Shooting the displays at night can be a bit tricky, but it's good practice with the camera. It being Montreal however, the cold is also an issue, and despite roasting some marshmallows by some of the fire-pits they had set up, we needed to escape inside for a bit. The festival tent we escaped into was also home to some touch screen displays that allowed visitors to interact with various pictures taken at the event. 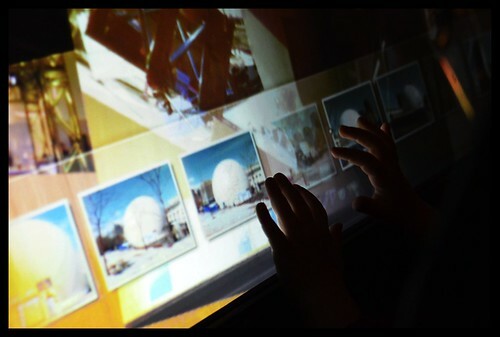 Even in this age, where touch screen interfaces are no longer science-fiction, people still have some fascinating reactions to it, so I couldn't resist capturing a set of pictures of people touching the screens. T O U C H, a set on Flickr. A good weekend's wander with the camera never goes amiss!